This is our review of Paradise’s product Saffr-Tone. The product name has been derived from the words Saffron and Serotonin. Saffron is commonly used as a spice in cooking and is a very expensive product due to the labor intensiveness during harvest. Research indicates that Saffron acts on our serotonin levels, the hormone commonly known as the feel-good-hormone. 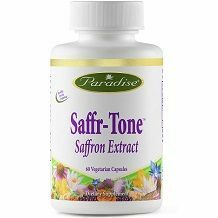 The theory behind taking Saffron supplements in general, and specifically Saffr-Tone, is that when your mood is boosted, you feel less stressed, resulting in better sleep, more balance in your life and more clarity to make better food choices; an overall recipe for maintaining a healthy body weight. But does this product really deliver on all of that? Continue reading our review of Saffr-Tone and decide for yourself. 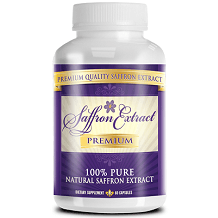 Saffron Stigma Extract (15mg per capsule) is the main active ingredient, derived from the Crocus Sativus plant. Its active constituents are saffranal, crocin and picrocrocin. These capsules are made from vegetable materials making them 100% vegetarian. No binders or allergens are used. Unfortunately, the adequate daily value for saffron extract has not yet been established. The manufacturers recommend taking one capsule twice daily, in the morning and in the evening. It should be avoided if you are pregnant and is it is recommended to first consult your healthcare practitioner before using it if you have a medical condition and are using chronic medication. Paradise mentions no side effects from taking Saffr-Tone. This active ingredient has been associated with side effects such as dizziness, dry mouth, headache, drowsiness, and nausea, but this is seldom, and a healthy adult should not experience these. This product is available online from the manufacturer’s website for $19.99. It is packaged in bottles containing 60 capsules each. It is also available from third party websites such as Amazon. The manufacturers do not provide a money-back guarantee on their product, which leaves some doubt in the efficacy of the product. Paradise Saffr-Tone seems to be a promising product to aid in appetite suppression and mood improvement, all measures that should lead to weight loss. Their 100% vegetarian capsules are also a plus. Unfortunately, Paradise provides no money-back guarantee, which always instills some doubt in the efficacy of the product. Along with no guarantee, we found a few negative reviews claiming the product did not work for them. Since Saffron Extract has no established adequate daily intake, we also query whether the 15mg per capsule is enough to make much of a difference. Many other products contain in the range of 82mg per capsule, without any side effects. We recommend looking at other similar products on the market before making a final decision.